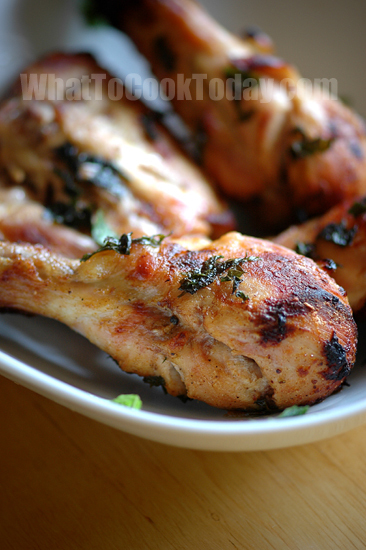 Tandoori Chicken is a highly popular dish in India and South Asia. 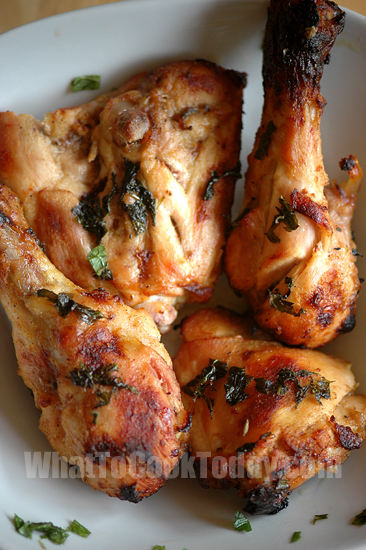 The chicken is marinated for the period of 8-24 hour in spices, yogurt, garam masala. The chicken is then cooked at high temperatures in a tandoor (clay oven), but can also be prepared on a traditional barbecue grill or oven. Tandoori chicken is usually characterized by its red fiery look or orangey color from turmeric. This recipe kinda lies in between. The chicken isn’t all too red or orangey. According to the cookbook At home with Madhur Jaffrey, Tandoori chicken tastes just as good cold as it does hot, which is perfect for everyday meals, formal dinners, and picnics. If you properly wrapped and refrigerate the chicken, they may hold for 5-6 days. But our Tandoori chicken didn’t make it to 5-6 days though. They were gone fast! 3. Preheat oven to 500 F. Oven may varies, so be sure you know your oven well and make sure oven is clean because if not, any remnants in there will get burned badly at 500 F and causes smoke.